Ti West must have endured the most haunted of houses during his childhood, because only through first-hand experience can somebody gain, preserve and later paint such an enticing scary picture. Both a thematic precursor to his 2011 spook-gala The Innkeepers and a nostalgic nod to horror in general, The House of the Devil serves up a cauldron full of tension and idiosyncratic peculiarities. Framed within a B movie context where babysitters are in danger, wooden houses creak with undesirable exaggeration and a grainy glaze smoulders from the screen, the film embodies the work of a director smart enough to create a piece that stands out in its maturity whilst also retaining key horror tropes. West admirably holds back in an area where many others have succumbed to generic jump-scares and gore, instead teasing and withholding clarification before building to a timely, creepy crescendo. 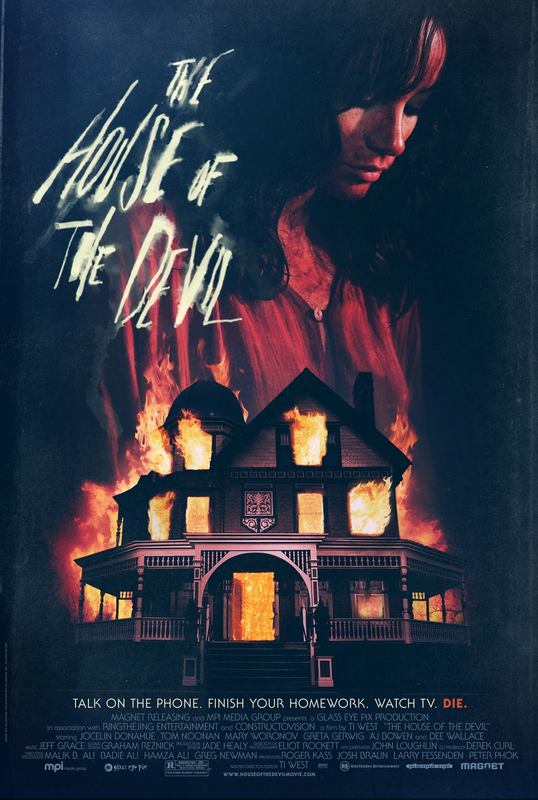 Paying homage to the haunted house flicks of the 70s and 80s, The House of the Devil concludes the greatest fear is that which cannot be explained, and sometimes the unexplainable thrives inside four walls. Struggling for cash and trying to fend off a landlady breathing down her neck, Samantha (Jocelin Donahue) throws her name in the babysitting hat. After an odd conversation or two over the phone, she accepts a job offer at short notice given the monetary incentive. Upon reaching her office for the night — a secluded manor hidden amongst the arching trees and a wispy fog — Samantha meets the voice on the other end of her phone calls, Mr. Ulman (Tom Noonan), whose edgy nature reflects the pair’s recent kooky interactions. In fact, Mr. Ulman’s demeanour ain’t the only bizarre manifestation, and it looks like Samantha is in for a long night. Pizza, anybody? Undoubtedly, The House of the Devil’s greatest strength is its restraint; both from divulging all of the answers immediately, and from rashly conceding to the genericism that has hampered the land of fright — or not — in recent years. Here, mystery shrouds all. Noises echo without a source. Light switches don’t exist in their usual spot on the wall. From the get-go, and even more so when goings-on reach the ill-fated haunted house, there extrinsically exists an offbeat ambiance. Ti West generates a tone that always promises an explosion of manic torment — we’re fully aware that things could kick-off at any moment — but one that relentlessly goads the viewer as tension creeps higher and higher. An inspired tactic, really. Jeff Grace’s score drones one moment, as if signalling an inert-yet-eerie mundanity, before tingling the ears with sharp bursts that are of the genre but difficult to pinpoint. The cinematography too, relayed by Eliot Rockett, adds to an underlying sense of confusion as the camera stalks Samantha around the house, watching her, waiting for something to frighten; for a head to grace a mirror, or a silhouette to find the shadows, or a figure to appear from behind a door. Samantha often peers from windows and, as the camera pans backwards, we see her for the stranded victim that she is, unbeknown, trapped inside a house that evoked warnings signs way before the front door rattled its hinges to greet our protagonist. West successfully bolsters this unwavering feeling of mystery and disorientation by suggesting a splatter-fest early on, and subsequently reshuffling the narrative towards the aforementioned suspense-fuelled happenings. Certainly, The House of the Devil avoids any universal horror trap holes, yet the film still reverberates B movie vibes that are welcomed rather than denounced. The premise hardly emits intuition, whereas the execution does entirely and therein lies the success. Characters find a place on the caricature spectrum and remain there throughout; the tall Mr. Ulman’s exasperated oddness contrasts his wife’s sheik, Gothic appearance — it’s not lost on the viewer that she ascends from the basement — and Samantha’s goofy friend Megan is seemingly only able to speak hokily (“How d’ya like them apples?”). Upon conclusion we are greeted by grimy yellow credits, though not before a series of exceedingly haunting flashing imagery. Off-putting in the hands of another, these familiar tropes work effectively here because they coincide with West’s unusually, expertly, tentative approach. Though not as concise as the narrative, and also slightly constrained by common characters, the performances are solid. Leading the way as Samantha, Jocelin Donahue displays the type of defiant resolve towards the beginning that ends up getting you in trouble, before steadily warping into a paranoid employee. If only she’d listened to her mate Megan, played by Greta Gerwig, whose “it’s too good to be true” caution warrants observation. Gerwig doesn’t have an awful lot to do here, though going by her recent work there’s no questing the Californian’s acting prowess. The most enjoyable performance is evasive and intriguing, delivered by Tom Noonan as Mr. Ulman. Noonan’s unassured motions are the source from which mystery and unusualness sprinkle, aided by his knack for not directly answering questions (“No, not exactly…”). Mary Woronov has little to do as Mrs. Ulman, and A. J. Bowen also makes a fruitless appearance, consolidating the problem that sees one character too many materialise. Listen out for the voice of Girls favourite Lena Dunham. Ti West is purposeful in direction, creating an atmosphere of ascending dread and hopeless lunacy. His meticulous input sees fear spawn from peculiarity, so much so that even nuances such as the tallness of a stranger promotes creep, and this execution thrives alongside a grin-inducing B movie panache. The House of the Devil is an appreciative mishmash of horror; from haunted house to satanic ritual to psychological thriller, with a gloss of gore. Wait until the end too, for when that inevitable crescendo hits, there may yet be a surprise in store. The last couple minutes of this is absolute bananas, but everything else is done in a way that’s not just steady, but pretty damn tense as well. Good review. Completely concur! I think the ending works too, particularly given the amount of odd tension built up over the previous seventy minutes or so. Thanks Dan. This one is currently on my DVR. Thanks to your review, I’m really looking forward to checking it out. Nice job! I had it waiting on mine too for a while – it was worth the wait! Hope you enjoy it as much as I did. Thanks for stopping by! Spot on review – I saw this film without knowing much about it and loved it. It was a total surprise but it’s constraint and finely crafted scary moments really worked. The atmosphere was incredible and I hadn’t really thought about it, but i love your point about how West managed to mish-mash various horror themes and styles. Good stuff! I couldn’t have put it any better myself, this really is a horror treat. Probably not as revered, or at least well-known, as it should be. Thanks mate! I never did see this, but you make it sound close to exceptional. I’ll give it a shot at some point. I don’t quite think it holds the weight of a five star outing, but it’s not too far away. The film is actually fairly simple – its execution is absolutely on point though. What it does, it does extremely well for my liking. If you do, I hope you enjoy! Nice review, Adam! Y’know, I saw this awhile back and I didn’t care for it, but I’ve seen so many positive reviews since then that I think I may have to give it a second chance. Thanks Cara! That’s a shame, but it’s also the wonderful thing about films – so many opinions and nobody is wrong. Give it another go if you get the chance!